Starting 30 years ago, my family joined others — those of my mom’s four best college friends — for a Memorial Day weekend getaway in Hyannisport, Mass., that quickly became an annual tradition. As a result, all through high school and college, I never knew what it was like to be home for Memorial Day weekend, had never seen a Memorial Day parade (still haven’t, but that’s because I’m usually either working or, in some recent years, on a different vacation), and always associated the final Monday in May with beating the traffic off Cape Cod and hoping that there would be no accidents on I-95. Daytime baseball on the radio during the holiday was always a great way to pass the time — especially in traffic. But because our trips were always at the end of May, I missed out on the joy of the Cape Cod Baseball League. Except for one year, 1991, when my parents added a summer week on the Cape to our usual journey up to Maine to visit family. We stayed in Chatham and went to games there and in Orleans. I enjoyed the small fields and close access, which allowed me to hunt for autographs and make my first attempts at close-to-the-action sports photography. I loved the small-town baseball, the proximity to the field and access to the players. Among the autographs I got were those of Hyannis Mets Jason Varitek and Rich Aurilia and Chatham Athletic Chris Michalak. 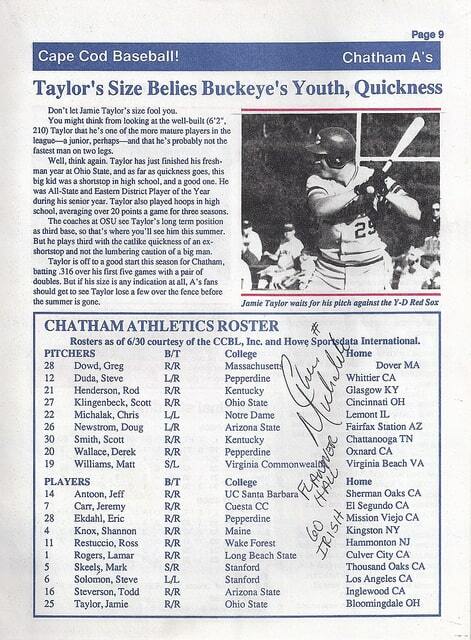 I don’t remember talking with Varitek, but by sheer chance, it turns out he was the only one to sign one of the stat sheets I received at the game between Hyannis and Chatham. After the game, if I remember correctly, fans were allowed onto the field to meet the players, and that’s where I told Aurilia we had the same birthday (Sept. 2) and mentioned to Michalak that my dad also went to Notre Dame. He asked me my dad’s dorm, and I had no idea, so he shifted from writing out his uniform number to giving me the name of his dorm — Flanner Hall — and the inscription, “GO IRISH.” Three years later, both would become very familiar to me when I learned that my freshman dorm, Grace Hall, was the twin to another 10-story housing unit for male students: Flanner Hall. 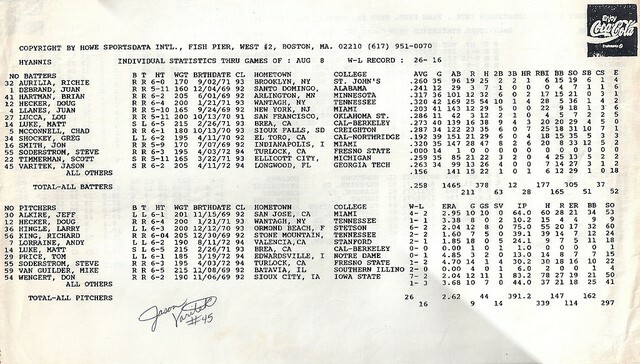 Amazingly, I kept the program and stat sheets with the autographs in pretty good condition all these years, allowing me to scan and post them. 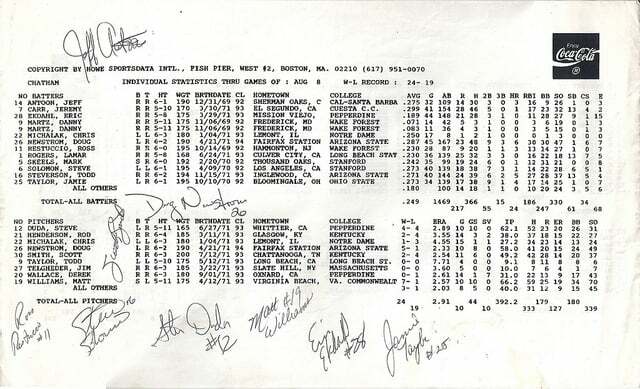 The one autograph that may be lost to history is the Cape Cod Times sports section that featured coverage of a no-hitter thrown by Hyannis’ Richard King. 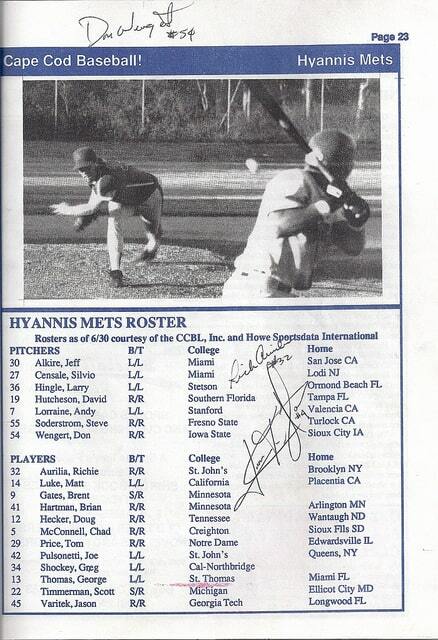 I wasn’t at the game, but I had him sign the paper when the Mets came to Chatham a night or two later. 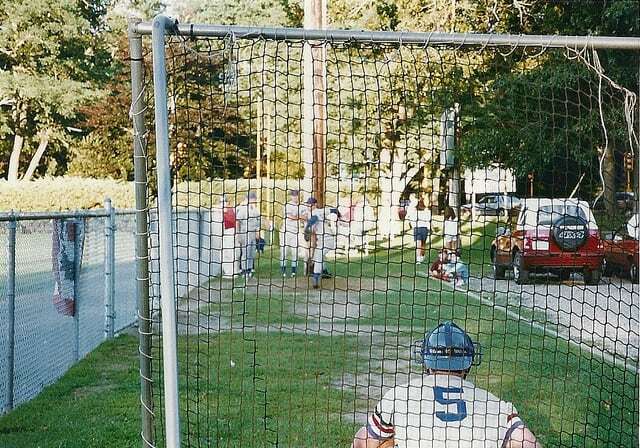 At Chatham’s field, I remember my sister and I setting up blankets on the bleachers behind home plate, then walking around before the game started and spending much — if not all — of the contest in that spot. A night or two later, when we saw the A’s on the road against the Orleans Cardinals, I remember walking around the field during the game. The bleachers were smaller, but the entire first-base/right-field line runs along a tiered berm that is perfectly suited to laying out blankets or unfolding lawn chairs to take in the game. Beach by day and this setting for a ballgame at night? That is heaven. Though Varitek, Aurilia, the Domer Michalak and Don Wengert, a pitcher for Hyannis that summer, all reached the Majors, the name I remembered most was that of Doug Newstrom. (However, often through the years, I confused Wengert with King, thinking that the guy who had been good enough to pitch a no-hitter on the Cape also reached the Majors with the A’s and five other teams.) Newstrom was a two-way talent from Arizona State who, at the time I saw Chatham play, was 5-1 with a 2.33 ERA and batting .287 with a team-leading six homers and 30 RBIs. He was the starting pitcher the night we saw the A’s at Orleans and might have served as his own DH. But after an eight-year minor league career that included two summers with New Haven of the Eastern League (thereby bringing him through Trenton) and finally reaching Triple-A with Tucson in the Diamondbacks’ organization, his career ended in 2000. Unfortunately, those remain the only Cape League games I’ve attended. Many is the summer I’ve thought of a return trip, but I’ve yet to make it happen. LATER TODAY: Visiting the Cape Cod Baseball League Hall of Fame, something I didn’t know existed until last week.